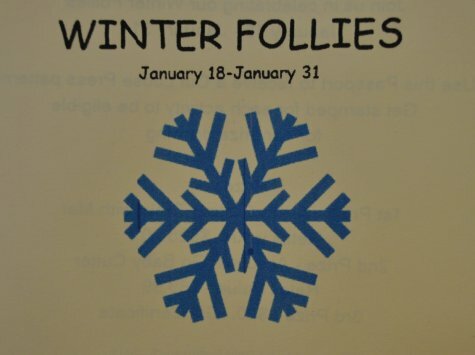 I just wanted to remind you that our Winter Follies Passport Event starts Monday, January 18th. That is this Monday! Can you believe it?! The Passport is $3 and includes a pattern and one other random goodie all in a goodie bag. Get your Passport stamped between January 18-30 for 1 yard of regular priced fabric, 1 notion, 1 pattern, 1 spool of thread and watch 2 demos to get your Passport stamped. Once you have everything stamped, you will be enter for a chance to win an Arrow Cabinets Pixie Cutting Table, a GO! Baby or a $50 Gift Certificate. The demos will be through out the day during the event. They will back to back so you won't have to wait long for the next demo to come available. Passports are now available to pick up! It's $25 for the class and it includes the pattern. 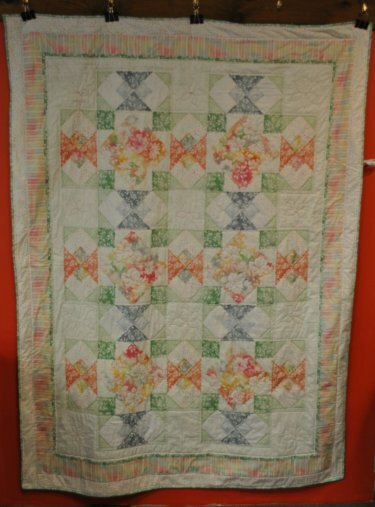 It's a nice bright cheery quilt that is perfect to be working on during the deary Winter days. It will be so nice, snuggly and bright for the upcoming Winter days. I tried to snuggle in the one Grandma just quilted but she wouldn't let me. She said it was to hang up not for puppies to lay on. We have all the fabrics needed to make this quilt in stock at the Shop. We hope to see everyone very soon. We are very excited about the Winter Follies and the Mimosa Quilt Class.